I went on two walks this week with PEDS’ Ian Sansom, the first through Midtown with a group of students and locals, and the second in Clayton County’s Southlake Mall and Olde Towne Morrow yesterday morning. While the former was a much more enjoyable walk, the latter was far more educational. On Monday evening, I walked from Park Pride’s Parks & Greenspaces Conference at the Atlanta Botanical Garden to the Fox Theatre where the PEDS walk was scheduled to begin. 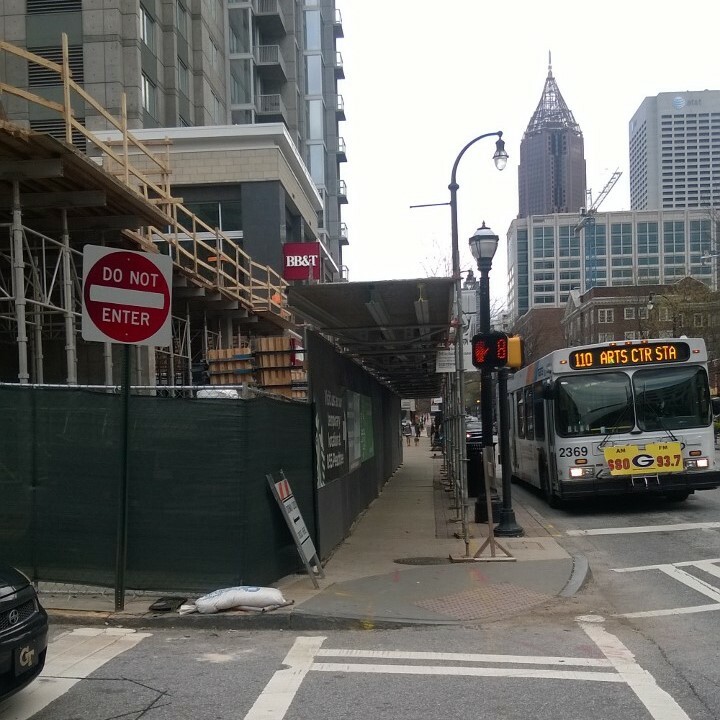 From there, we walked down Peachtree, looking for construction sites that blocked off the sidewalk. It didn’t take us very long before a we encountered a “sidewalk closed” sign directing us to cross the street. 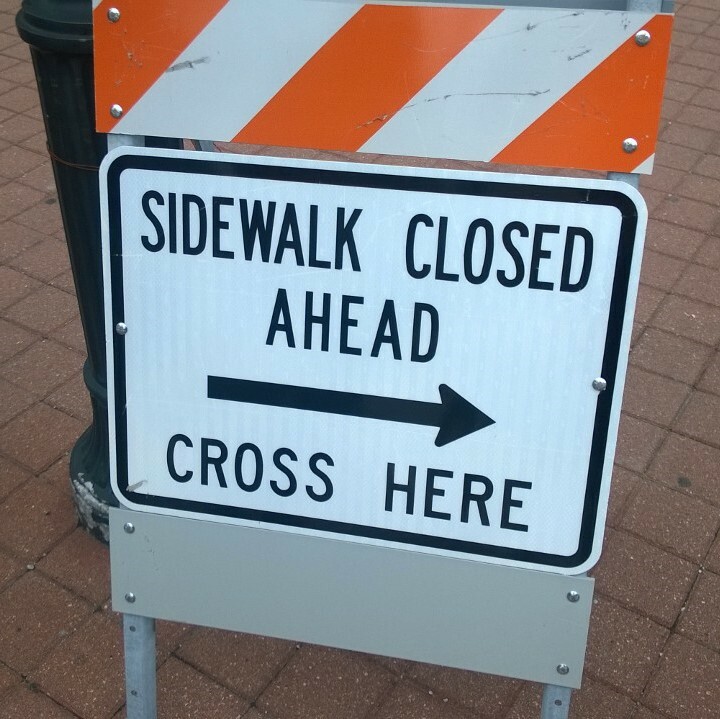 Ian pointed out that construction companies are required to provide a walkway on the sidewalk for pedestrians or pay a fine; however, the fine for blocking a sidewalk usually costs less than providing a covered walkway, so most construction companies pay the fine and break out the “sidewalk closed” sign. In Midtown, a part of the city with wide sidewalks on both sides of nearly every street, this isn’t a huge problem. We just crossed the street and kept going. Midtown puts such an emphasis on walkability that “everyone should be a ten minute walk from open space,” Kevin Green, President and CEO of Midtown Alliance, said that same day at the Parks & Greenspaces Conference. We wrapped up our walk with a few more examples of construction site sidewalks before sitting down at Steel Restaurant. An example of a good covered walkway by a construction site in Midtown. My trip to Clayton County could not have been more different. When Ian and I finally headed out on the 196, everything was off to a pretty great start. Our bus driver was pleasant and polite, the bus was one of the newer models, smoothly speeding down I-85. The bus was astonishingly full; for anyone who’s ridden a MARTA bus during non-peak traffic hours, you can imagine my surprise that the bus was almost entirely occupied. 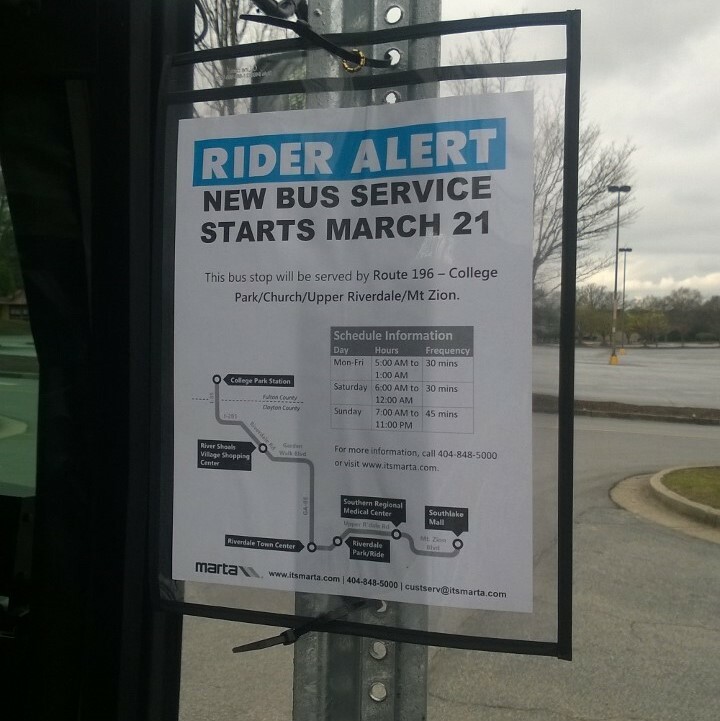 In lieu of participating in MARTA back in 1971, Clayton County developed its own bus system, dubbed C-Tran, despite growing demand for MARTA during the 1990’s and 2000’s. When Clayton County could no longer afford to maintain C-Tran in 2010, demand for MARTA grew even more. Finally, the decision to join the City of Atlanta, DeKalb, and Fulton counties’ inclusion in MARTA was put up to vote in November and passed with overwhelming support. The landscape of Clayton County is dominated by Georgia pines and by cars–not just on the road, but by auto-shops, abandoned used car lots, some struggling stores, drive-thru’s, and more gas stations than you can count. It’s the defining characteristic of this place. Our first stop was outside of an apartment building just off I-85. I was surprised by the quality of the sidewalks, or the fact that there were even sidewalks on both sides of the road as far as I could see. However, there was no shelter or bench at the stop (granted MARTA has had a very short time frame for rolling out these routes). In the duration of our trip, I see only two shelters and benches, which makes the system feel a little inhospitable. The bus stops at Southlake Mall before making the return trip to College Park, so we get out and walk around for a bit. When we get back onboard the bus, a MARTA attendant hands me some brochures. 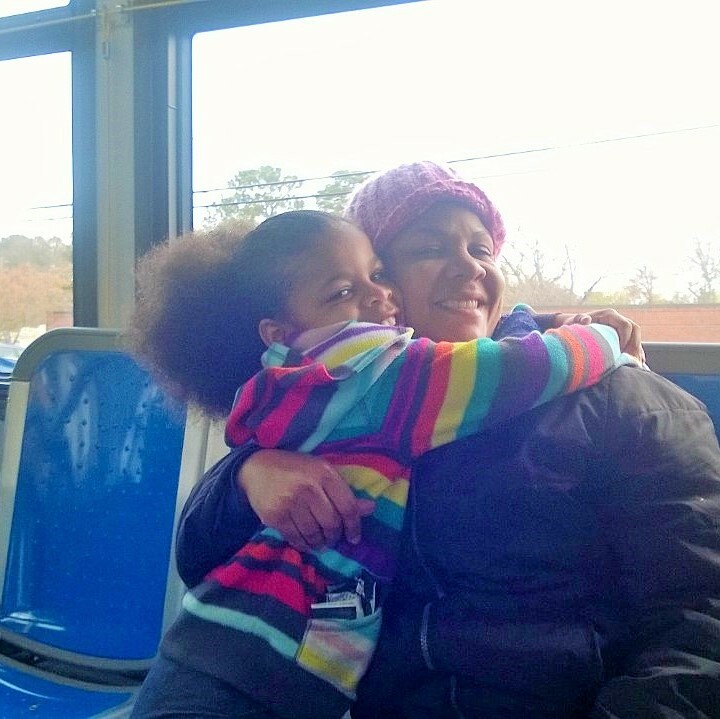 “Here’s some info on how to ride MARTA,” she says with a smile. It still surprised me: They haven’t had MARTA here, of course MARTA’s handing out pamphlets. On the ride back to the train, we watch as a woman crosses 10 lanes of traffic on Tara Boulevard to get on the bus. For a moment, she was stranded on the median in a swirling ocean of traffic, and was out of breath from running across the last five lanes when she got on the bus. Proximity to jobs increased in Atlanta’s suburbs between 2000-2012 more than in the inner city. Source: Brookings. Most of the bus ride after that was fairly droll, until later when an older man got on the bus at a stop about 20 feet from a carwash. After sitting down, he asked the MARTA attendant something Ian and I had been mulling over ourselves. “Why do they put a bus stop down in front of a carwash instead of by the corner where people are walking? What, are people going to drive their car, get it washed, and hop on the bus? They don’t need the bus! It makes no sense.” Ian got his contact info and tried to answer some questions, but he was fired up. Like many in Atlanta tired of the region’s transit troubles, he doesn’t want answers, he wants actions.